Available in paperback or kindle. 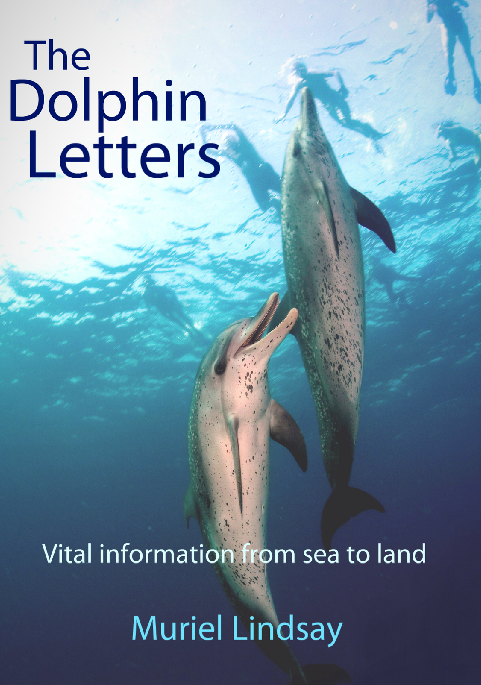 "The Dolphin Letters", subtitled "Vital Information from Sea to Land" is just that, a compendium of vital information from an unlikely source, part of the intelligence that lives in the water, the dolphins. The information in this book lends not just hope to the human race, but excitement about the future as well during these dynamically shifting times. Interestingly enough, this book is not primarily about saving the planet, or the dolphins. Rather, the book offers a way of understanding that for the human race to go on to thrive, it must save itself BY coming to collaborate with the intelligence in the waters, and in all parts of the natural world, for that matter. It is US we are trying to save. The dolphins communicate in a tone that is unique and strangely recognizable. The author was merely the "scribe" as she puts it. How that came to be she explains in the beginning of the book, but the point of why this book is important is definitely about the vital and now shared information it contains. To read this book is to be simultaneously uplifted and grounded in undeniable truth. As the literary agent for Eckhart Tolle, Neale Donald Walsch and many other great spiritual teachers I have often read classic books of wisdom before anyone else. This short book, The Dolphin Letters, is such a book. You do not need to believe in dolphin communication to benefit from this book. The messages in these letters for those with higher spiritual awareness are simply pure truth. The intelligence of the Dolphins is the intelligence of the Universe itself. Dolphin consciousness is superior to human consciousness at this time and a reflection from the future of where human consciousness must evolve to if we are to survive as a species. This is a book of great hope. I encourage everyone to read this book and share it with everyone you know. Just reading The Dolphin Letters is a healing experience. For those of you who are ready, a direction is given with specific instructions of how you can become a truly global and galactic citizen and dip ever more completely into the joy of creation and the creation of your life. The Dolphin Letters bring us wisdom from the very source of all life, water and our early relatives who have had a far longer experience of life than young Homo sapiens sapiens, only 50,000 year old. The dolphins and whales have millions of years of experience. This is a wise and loving book and I recommend it as a blessing for all of us. "As this globe struggles with understanding human conflict and suffering, Muriel Lindsay offers us a deeper insight into the Web of Life and shows us what is right before our eyes. After reading this book, the unplumbed depths of what it is to be connected with compassion and love is at our fingertips. Don't neglect this gift." Dr. Ervin Laszlo, Founder of the Club of Budapest, two time Nobel Peace Prize Nominee and author of "Science and the Akashic Field"
The dolphins say, "It is exactly when things are the most in jeopardy that the greatest opportunity exists for something new to be born." Their letters are a way to midwife the something new. The dolphins have incredible wisdom and a perspective that no human has. A perspective that comes closest to an intelligence that views us from above - and is yet part of us. The dolphins tell us that we - we and them - are in jeopardy. And they tell us that they are ready to work with us to overcome it. They also say what is needed for that. Now it's up to us. To join with all positive forces and initiatives on this Earth in the common mission: to create a sustainable web of life where all can flourish. This is our chance. The jeopardy is real, and the advice from this usual source is wise. Let's take it to heart. Bruce Joel Rubin, screenwriter, GHOST, JACOB’S LADDER, MY LIFE, DEEP IMPACT, THE TIME TRAVELER’S WIFE. "I have known Muriel and her love for dolphins for a long time. I have been charmed by her immersion in their lives and knew that they spoke to her in a language most humans would not understand. I watched her life transform as their messages took root in her and always felt a little jealous that I could not hear them too. But now she has changed all that. She has brought forth a world of unique planetary awareness and profound universal wisdom that speaks directly into our psyches. It is as though Muriel has enabled another life form to show us truths about who we humans truly are. Reading her book is a revelation. While I pray that it may help us humans save our dolphin friends, I believe that it is the dolphins who are actually saving us." THE DOLPHIN LETTERS presents a wealth of wisdom reflecting hope, beauty, and grace. As the author and publisher explain, whether these "dolphin letters" are metaphysical or metaphorical is not what matters; what is important is that these sacred messages are heard and celebrated. Be prepared to be inspired.